A satellite in areostationary orbit is a satellite in a circular, synchronous orbit at the equator, making it appear stationary in the sky above the ground. 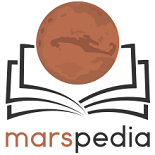 As shown on the synchronous orbit page, a satellite must have a semi-major axis of 20,427.7 km to have its orbital period equal the rotational period of Mars. Since an aerostationary satellite is in a circular orbit, the orbital radius equals the semi-major axis, 20,427.7 km, placing it at an altitude of 17,038.2 km above the Martian surface. This puts Mars stationary orbit above Phobos (9,376 km) and below Deimos (23,463 km). Mars is not perfectly spherical, and so most satellites in areosynchronous orbit will tend to drift if left free-flying without station-keeping maneuvers. However, there are latitudes which have been shown to be equilibrium points in areosynchronous orbit. There are two stable equilibrium points at 17.92W and 167.83E, and there are two unstable equilibrium points at 105.55W and 75.34E. For an areostationary satellite, coverage can be approximated as a circular region below the satellite. This coverage area could be defined as one in which all points remain in the satellite's field of view at all times, or an area in which a unit on the ground maintains contact with the areostationary satellite at all times. The visible disk of Mars takes up a field of view of about 23.6° as seen from the satellite in areostationary orbit. 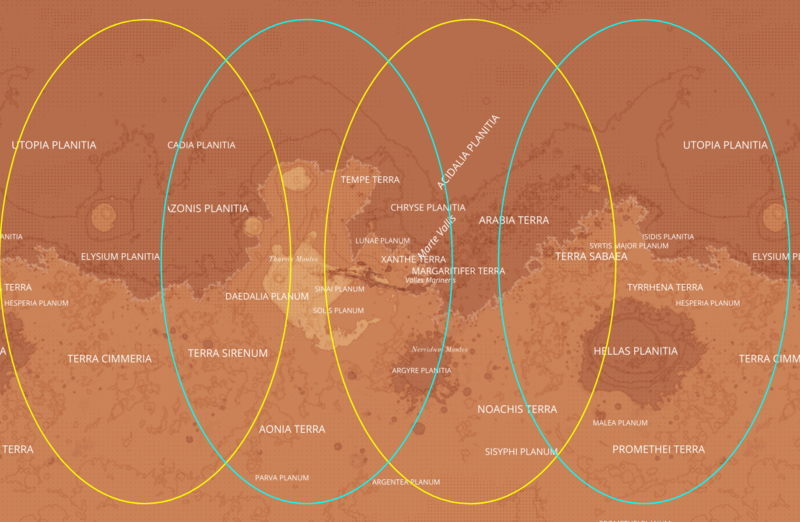 The coverage zone is a cap on surface of Mars that reaches up to approximately 78° latitude. The coverage zones in this map approximate those of satellites in the two stable equilibrium points (yellow) and the two unstable equilibrium points (cyan). Plotted with Leaflet using tiles from OpenPlanetaryMap. A more realistic plot of coverage might take into account both altitude data and the non-spherical shape of Mars. ↑ Juan J. Silvaa and Pilar Romero Silvaa (2013). "Optimal longitudes determination for the station keeping of areostationary satellites". Planetary and Space Science 87 (October).